These are not the diapers of the 70's! No diaper service required. By washing at home, you get to decide what products and/or (not) chemicals with which you wash your diapers. My diaper load is the easiest of all my laundry. It is already sorted and transportable from the baby's room directly to the washing machine with a pail liner. HE Washing Machines do the best at cleaning cloth diapers. Lots of rubbing and agitation gets them clean! The fast spin at the end helps with drying time, too. We use a "Bulky" setting for the wash cycle - it adds more water and a thorough soak at the beginning. Everybody seems to have an opinion on which and how much detergent to use/not use. What are the rules? No brighteners, enzymes, fragrances, dyes. Salt-based detergent (NO PLANT, like soy, coconut, etc). i.e. Don't use anything that will coat the fabric and compromise absorbency! No waxes or petroleum for the diaper balm. We use Magic Stick to create a nice, organic, moisture barrier on the skin. If a yeast infection is suspected - see your doctor. If you need to use Nystatin cream, switch to a disposable or GroVia BioSoaker. We use (and sell) Tiny Bubbles on all of our laundry. It is great for sensitive skin. Change baby. Pee-only diapers can go directly into the pail. 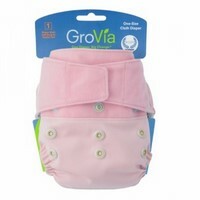 If you choose a fleece-lined diaper, like FuzziBunz or Bum Genius, most solids simply fall into the toilet. If you go with cotton, like a prefold or GroVia , you can lay a biodegradable liner between the baby and the diaper. When baby poops, simply grab the ends of the liner, and plop into toilet to flush. Word of caution: know what kind of plumbing you have in your house before you flush anything besides the norm! For instance, we have a poop-mulcher/pump because our plumbing terminates in our basement, below the grade of the sewer pipe. Having already had to replace the $1700 pump once because a tampon was thrown down the toilet, I don't think that the bioliners will have enough time to biodegrade before they are chewed up and wedged in the pump (and I am not going to test my theory). Same goes for Septic systems. Caveat Emptor. DO YOU NEED TO PREP? Definition: A washing and drying process that readies a naturally oily fiber, like cotton and hemp, to become fully absorbent. Prepping can be a pain, especially when you are excited to start using your diapers right away. But you only have to do it once and it makes all the difference in the world. DO NOT SKIP THIS STEP! Cotton and Hemp are my favorite diapering materials - but they can be tricky in the beginning. The great thing about natural fibers is that you can beat them up in the washing process and they only get more absorbent and soft. If you are using plain prefolds or hemp, I will offer you a short-cut. DO NOT do this with the GroVia Soakers or any AIO diapers as it will void the warranty, cause the waterproof material to shrink and render the elastic saggy and worthless. Fill 10 quart cooking pot with water. Bring to boil. Take off heat. Add 2 Tablespoon Dawn Original Dishwashing detergent and stir. Add cotton diapers, hemp, etc. Cover with lid and leave overnight. Throw into washer and wash with detergent and dry once. Wash on Hot with normal amount of detergent. Rinse. You may do this with other laundry, like towels, t-shirts, or sheets. Just don't prep with your other diapers or the oil from the new ones will coat the old ones and cause them all to repel. Once prepped, all of your diapers can be laundered together from here on out. 1) Grab your full diaper pail liner bag. Insert new one. 2) Drag bag to washing machine. Dump diapers in, toss in bag. 3) Set the wash for a Cold prewash/rinse cycle. No detergent. 4) When complete, set to 'Super Cycle' on Warm with the normal amount of detergent and double rinse. DO NOT use super duper HOT water on items that contain PUL or TPU (the waterproofing layer). Hot water will break down the fibers and cause tears, shrinkage, breaking. And will usually void the manufacturer's warranty. 5) Transfer to dryer on medium heat (be sure to read manufacturer's suggestions as well) or sun/line dry for extra energy savings and natural bleaching. What does “stripping” the diapers mean and should I be doing it? Too much detergent, not enough detergent, well-water, hard water, blah blah blah. If your diapers aren't working the way you think they ought to - or used to - it is time to strip them. Put your diapers in the washer, add 1-2 Tablespoons Dawn Dishwashing Detergent. DO NOT add too much as this product is not made for the washing machine and causes A LOT of bubbles. For my HE machine, I simply squirt in what might be 2 seconds worth of a light squeeze. Run a warm water wash with an extra cold water rinse. Wash again (short cycle) WITHOUT any detergent to thoroughly rinse your diapers. Your diapers should be ready to go again - revived! * Wash every 1-2 days. * Spray with Bac-Out Stain & Odor Eliminator by Bi-O-Kleen before you put soiled diaper into pail. * Get a toilet sprayer to blow off all the poop directly into toilet (where it belongs!). * Lay diaper out in the sun for a day (a natural and free disinfectant). * Use a bit of OxyClean in the second wash cycle. Use conservatively. Twice a month, whether we are cloth diapering or not, a good practice is to run a load of sheets, towels, shower curtains, etc with bleach or Hydrogen Peroxide (color-safe). This sanitizes the basin. Simply toss a cloth wipe (or torn piece of t-shirt) with a few drops of tea tree oil on it into your diaper pail and don't close the lid all the way. Wash with your diapers. Air circulation is your friend in the diaper pail. This and other knowledge articles can be found in our Cloth Diapering 101 section at www.bumritediapers.com. I somehow feel personally responsible for this posting :) Only four more washings to go!